When the summer sun shines and temperatures climb, conditions are ripe for ponds and lakes to produce harmful algal blooms (HAB). Most algae are harmless, but under the right conditions, certain types of algae can pose health risks. People and animals may become sick if they come into contact with or ingest affected water. In extreme cases, dogs and other animals have died after exposure to lake water containing a toxic kind of blue-green algae. “High rainfall results in nutrient-rich runoff entering our lakes, which fuels algae growth. As sunlight increases and temperatures warm, we can anticipate blooms of blue-green algae on many of our lakes,” said Minnesota Pollution Control Agency (MPCA) lakes expert Steve Heiskary. There are many types of blue-green algae found everywhere, but thrive particularly in warm, shallow, nutrient-rich lakes and ponds. 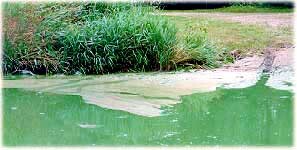 Often blown toward downwind shorelines, it is under these conditions that humans and animals come in contact with blue-green algae and where the risk of algal toxins is greatest. Not all blue-green algae are toxic, and there is no visual way to predict whether a blue-green algal bloom contains toxins harmful to humans or animals. But harmful blooms are sometimes said to look like pea soup, green paint, or floating mats of scum, and they often have a bad odor. “You don’t have to be an expert to recognize an algae bloom that might be harmful,” Heiskary said. “If it looks bad and smells bad, don’t take a chance. Stay out, and keep children and pets away from the water until the bloom subsides.” For more information about harmful algae blooms see the MPCA Blue Green Algae fact sheet or call the MPCA at 651-296-6300. If experiencing health effects, contact a medical professional. In addition, people are encouraged to report human health effects to the Minnesota Department of Health (MDH) Foodborne Illness Hotline (monitors all disease outbreaks) at 1-877-366-3455. For health questions, citizens can contact MDH’s Acute Disease Investigation and Control group at 651-201-5414 or visit the MDH’s Harmful Algal Bloom (HAB) web page.